It's been nearly a year since "Project SR-1" was teased to the public. 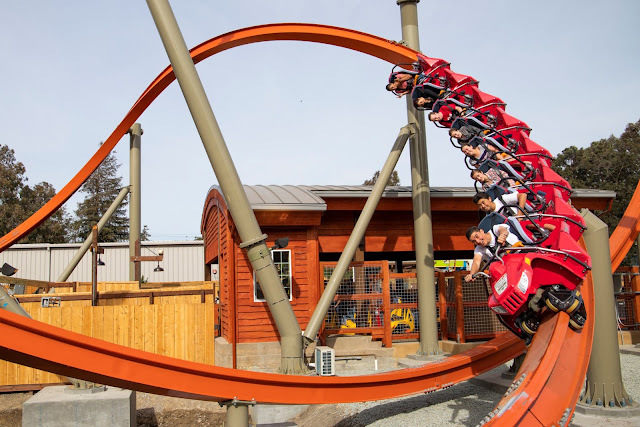 RailBlazer, one of the first Rocky Mountain Construction "Raptor" models to debut at a park (along with a mirror image in Texas under a DC Comics theme). The pair of these Raptors were a first ever for the RMC team. The concept of the ride besides being a skinny single-rail is to pack a punch in a small, affordable package by featuring a bunch of unique elements. Did Rocky Mountain Construction knock it out of the park once again? With over 30 laps on this coaster I feel comfortable enough with making a review for the attraction. Let's take a look. California's Great America wanted to theme their Raptor to the great outdoors along the California Coast and going on an offroad adventure. The ride definitely lives up to its adventure vibes. The queue goes over a waterway and past some of the rocky ravines the ride dives into and around as it snakes its way through the belly of the coaster, followed by a small section of switchbacks before going up the final stretch. Due to the low clearance of the brake run, part of the queue dips into the ground under the brake run before going back up to the station platform. Riders climb into the single file 8-passenger ATV-themed vehicles. They're fairly easy to get into but do be cautious not to bump into the restraint bar as it is kind of in the path. After a few rides, you'll get used to it. Once seated and harness pulled down (there is something satisfying feeling it click into place), area scans are performed and you are sent on your way. Before we discuss the play-by-play elements, we want to bring up the restraint system first. As you know, it uses an over the shoulder lap bar with a flexible heavy duty fabric (like a car seatbelt). Around the shoulders are some rubber pads to help alleviate pressure that can (and will) be felt during the course of the ride. Also unless you have been heavily stapled, the restraint doesn't really dig into your thighs or stomach...plenty of breathing room! And...dispatch! Your adventure begins on a 45-degree incline up 106 ft. To the left you have the view of the wooden hand rails, to the right, you get some nice views of the park. Once up top, you whip around the 180-degree turn over Hometown Square (Got some great views of the Red, White and Brews event taking place down below) before you go to a near crawl over the crest. If you're in the front, you're already dangling over the edge of the drop much like a dive coaster but without any holding brakes. In the back, you slow down before you even incline back up. Suddenly it feels like the train just gets yanked down the drop. In the front, the airtime is present but milder. In the back, you are out of your seat the entire time. Also keep in mind it's impossible to keep your feet flat on the floor unless you're really tall, prohibiting much movement. Being of an average height, I was fully airborne coming down the drop. You come to realize the bulk of what holds you in is the collar restraint. Diving through the ravine comes quick and before you know it, the late raven turn comes to greet you. In the front, you are shot skyward and you're out of your seat until you are nearly inverted heading back down. Honestly, it hardly feels like an inversion but it is still a crazy element I'm still trying to wrap my head around. In the back, the airtime is still present (and strong) but ends a little sooner. Off-axis airtime hill has to be one of the strongest moments of air on the ride. In all rows you are thrown upward and pinned against the collar until you are just about at the bottom coming out. Followed by the extreme airtime moment is probably the most disorienting part of the ride...the upward spiral and s-curve combo. If you're in the front you could begin graying out much like on Flight Deck. Once you've began getting tunnel vision, the midcourse drop sneaks upon you. In the back, the airtime is just about as strong as the off-axis but not as long. Still packs a whallop. The cutback and zero-g might be the the "breather moment" of the ride, both providing some nice inverted moments. Coming out of the zero-g (or corkscrew) you feel like you're going to collide with the nearby ravine surrounding the initial drop before facing the final, sharp overbank. During the corkscrew, especially toward the middle you get a nice floaty hangtime. The ride ends with a final reminder of the crazy air with a quick, strong pop into the brake run. It took about 6 rides to finally process what even happened as everything happens so quick. The ride is only 1800 feet long, statistically on the shorter side but the length feels about right with what the ride has to offer...especially with its intensity. Now keeping in mind, I don't have a firm grip yet on capacity/efficiency yet as the bulk of my ride sessions were during a private CGA staff event (as I'm part of the CGA team! ), and lines were minimal (about a 3 train wait at most, and as little as 2 back to back rides, break, 2 more back to back...). Several friends waited about an hour throughout the day with the queue about half full. Hopefully the ride crew will get their groove. Seemed like trains were cranking out pretty quick today. RailBlazer looks stunning at night even if it has a simplistic lighting package. The track color makes the ride pop at night, and especially striking just at dusk (blue hour) as the vibrant orange pops/contrasts against a deep blue sky. The ride itself is also great at night. While it isn't really darkaround the ride, it's definitely a different experience to be had. Coming out of the cave you are blinded by the onride camera...by the time your eyes adjust from the sudden lighting, the raven turn sneaks right upon you and can catch you off guard. 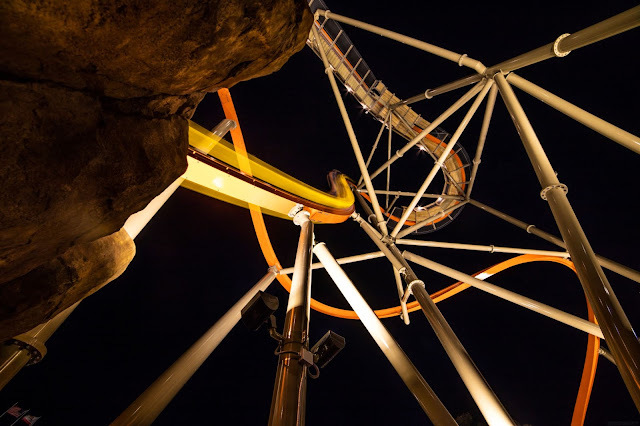 Looking down the drop at night is something else too and we recommend trying row 1 at night, followed by row 8 (which is by far our favorite row). Rocky Mountain Construction really created something solid in such a small footprint. I can see more smaller and mid-sized parks getting these models in the future. This ride is very well worth checking out. I'd be prepared for a wait in a lengthy queue as this makes its debut...pack your patience, do your restroom runs before getting in line as well as getting any drinks/snacks and getting your group together as there's nothing worse than being that guy who irritates the rest waiting in line because they want to "meet up" with their group...and don't want to be that guy who faces possible ejection from the park for doing such acts. 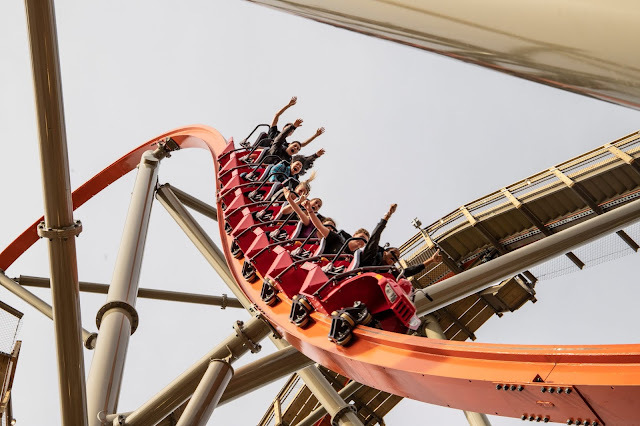 We've experienced this on the last coaster's big debut (Gold Striker) and have witnessed guests getting ejected from the park after pulling a similar act. Are you not one for coasters? The neighboring new show, RailBlazer Big Basin Bluegrass Band made its debut and is worth swinging by before taking on RailBlazer or relaxing after your crazy experience. 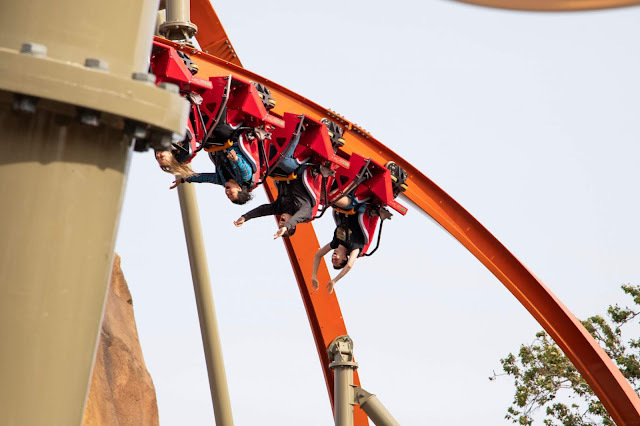 Did you get to experience RailBlazer this weekend as a passholder or last weekend as a CGA associate? What were your thoughts on the attraction? We can't wait to get back on it!